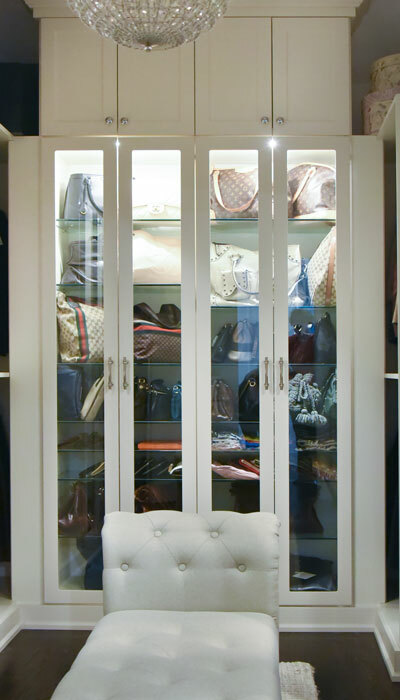 Closet Blog: Making Shoe and Purse Storage Easier than Ever Before! Shoes and purses are like potato chips - you can’t have just one. 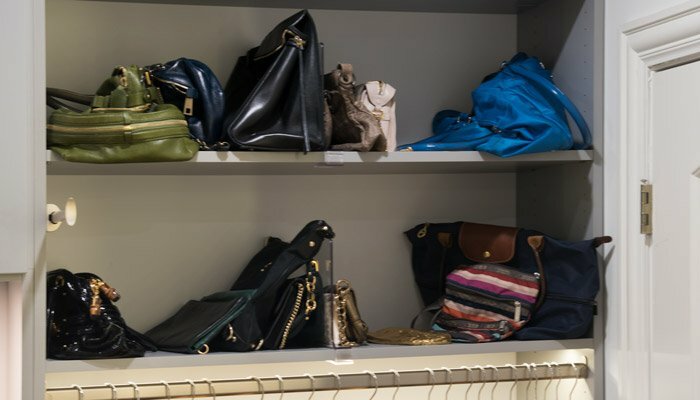 Some might say shoes and purses are addicting and with an ever-increasing collection, you’re going to need a place to store and organize them. 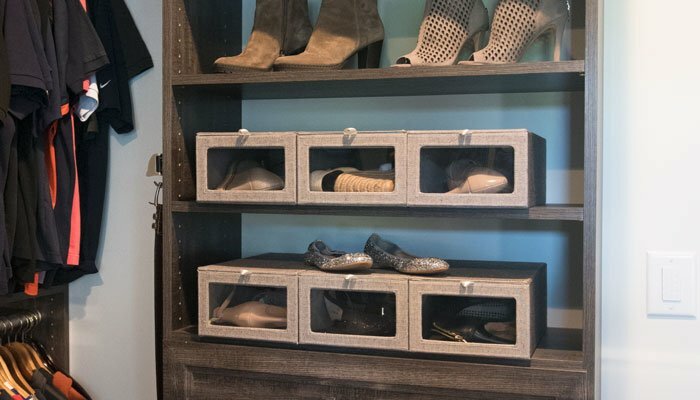 Whether it’s a temporary fix or a more permanent solution, there’s a number of creative ways to store your shoes and accessories away that will be functional and can even serve as a showcase. Closet Works is here to offer a variety of shoe and purse storage solutions ranging from DIY to professionally installed organization systems. Your closet can be renovated with permanent storage solutions and closet accessories that can do wonders for organizing your shoes and purses. 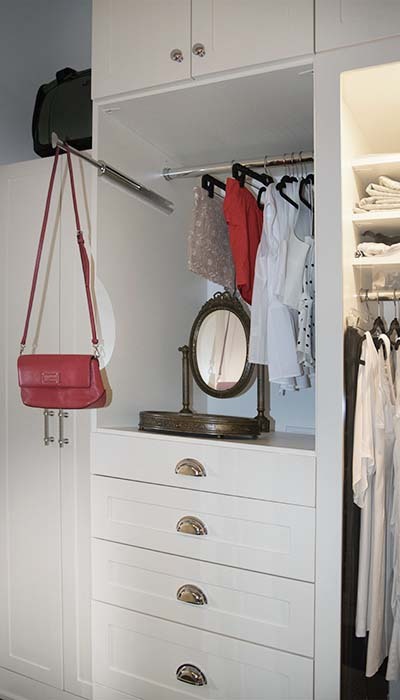 Here are some closet modifications and accessories that are catered specifically to shoes and purse storage. 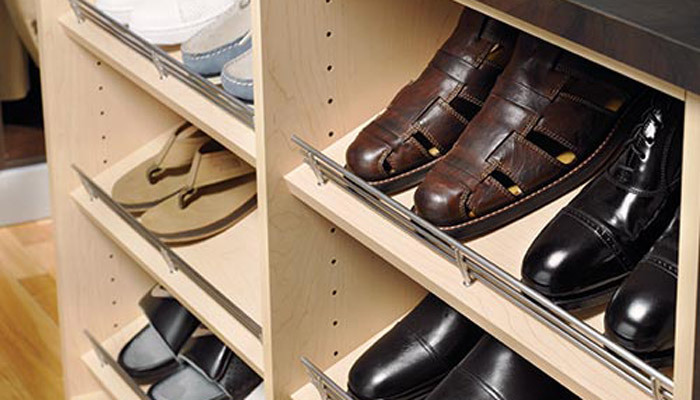 Adjustable shelves are great if you have a diverse selection of shoes ranging from sandals to tall boots. 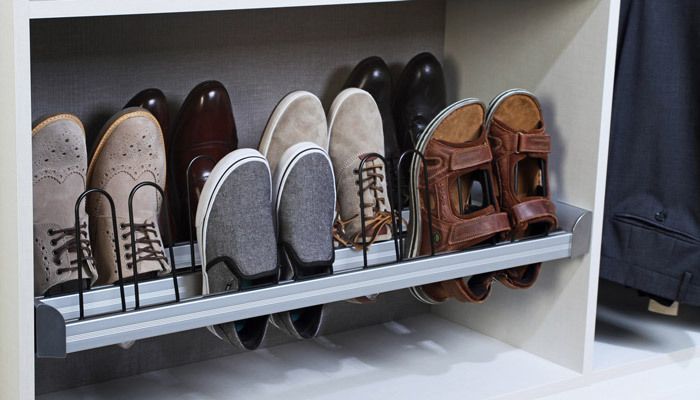 Having a separate shelving system or cabinet for shoes allows you to keep your shoes organized by season, type, and how often you wear them. 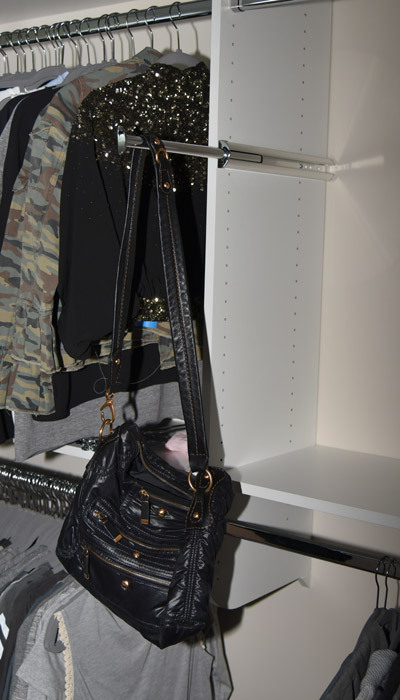 Adjustable shelves also work for purses if you have different sized bags. 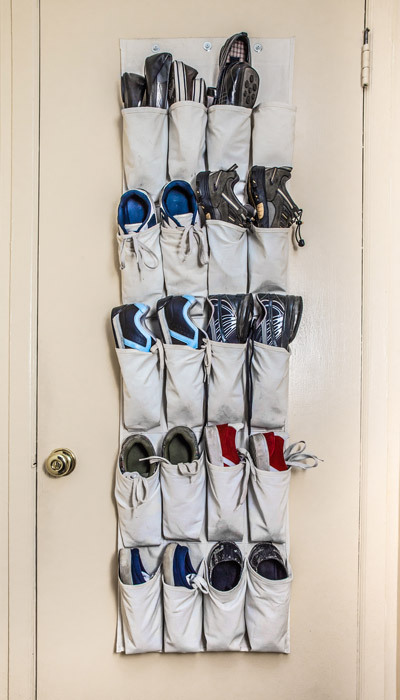 Pull-out shoe organizers work well for a more modest collection of shoes — holding up to 12 pairs of shoes. Shoe cubbies are a favorite way to keep shoes organized in a small space and work with more than just shoes — organize your clutches and jewelry boxes in the small compartments. 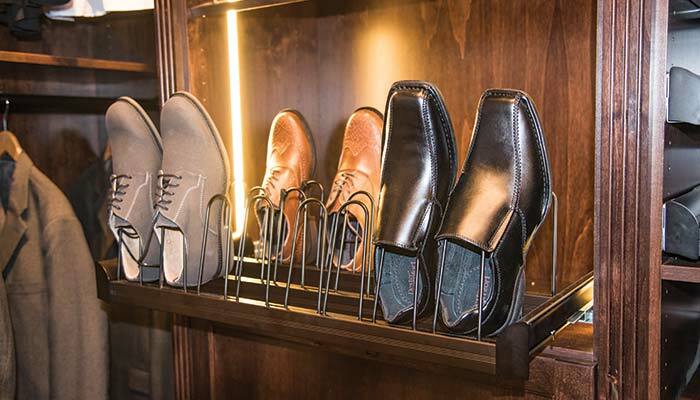 Slanted shelves with shoe fences bring the boutique to you, putting your shoes on display. Angled shelves make it easier to access shoes on higher shelves, too. 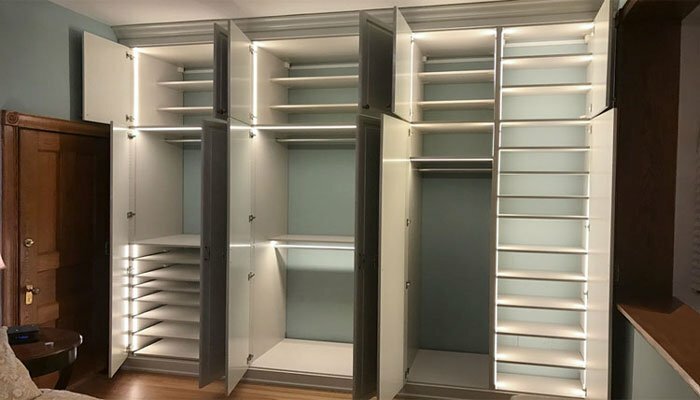 Pull-out shelves are a convenient option for wardrobes and cabinets, sliding in and out and holding up to 12 pairs of shoes to be organized per shelf. Pull-out pantry shelves show their flexibility as perfect clutch and purse organizers. 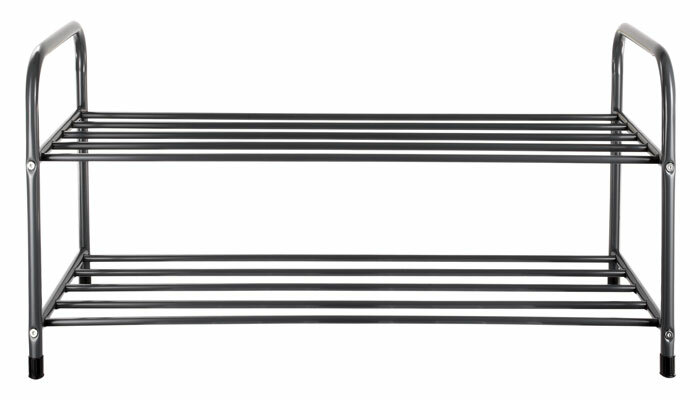 A valet pole allows you to hang up your commonly used bags and make sure they’re always readily available to grab and go. 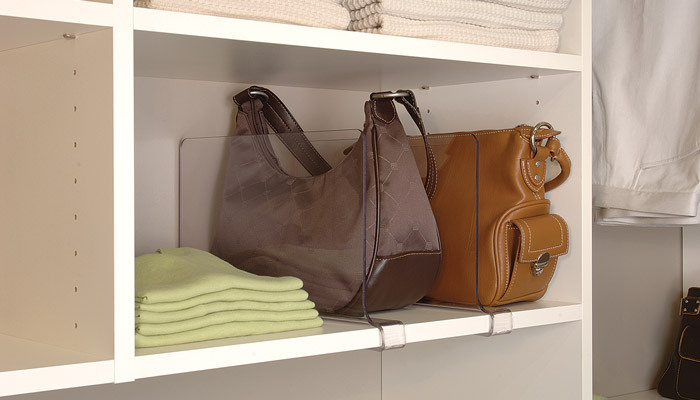 Acrylic shelf dividers make organizing your bags easier than ever by creating separate compartments simply by fastening them on to your shelves. It makes plenty of sense for purses to go on hooks, right? A cleat with hooks is a great closet or bedroom addition that will keep all your bags in one place. 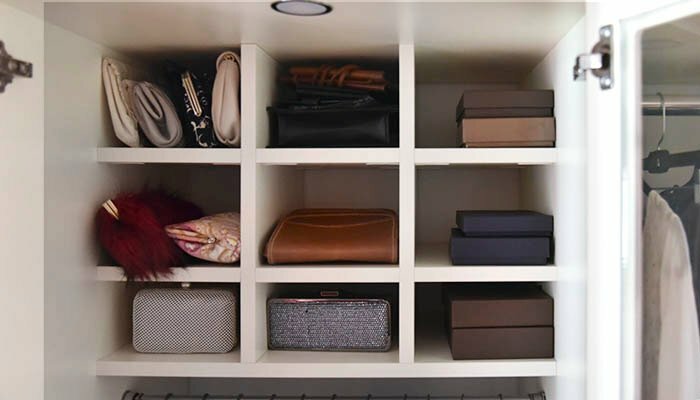 Whether you're on a budget, leasing an apartment or house, or simply don't have the space for an elaborate organization system, organizing purses and shoes can easily be done with some quick and inexpensive fixes. There are storage bins and boxes available that are made specifically to go underneath the bed. These bins come in a variety of materials including plastic, canvas, and wire — some even have wheels that make it super simple to slide in and out from underneath the bed. Canvas shoe organizers are available with dividers that create compartments for multiple pairs of shoes. An age old solution — hanging shoes over the door works perfectly with limited space. Wire rack shoe organizers that grip to the top of the door and canvas hanging organizers are inexpensive and are available many places online. 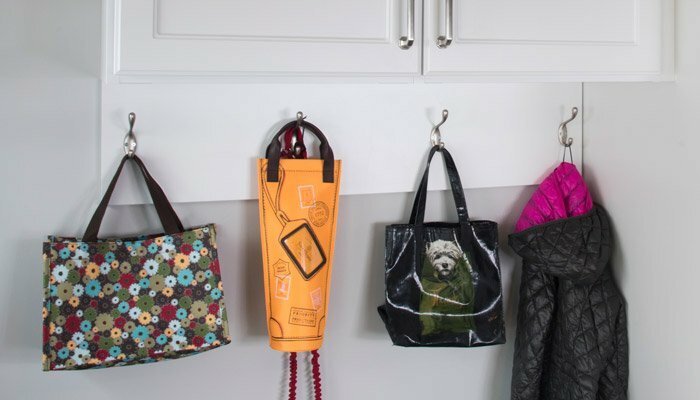 You can hang purses on removable hooks on the door as well. 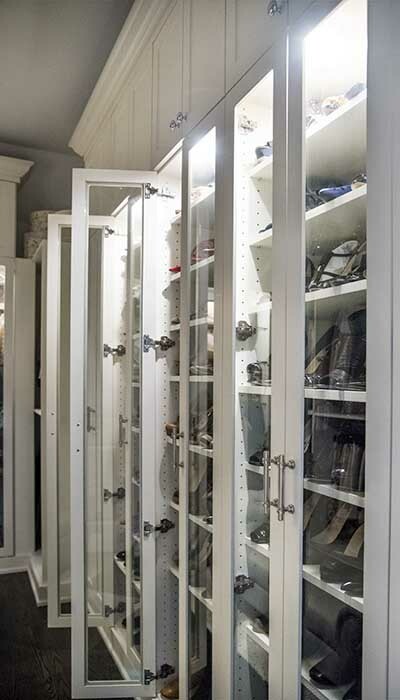 Racks are available in a variety of materials and come in different heights, widths, and with as many tiers as you'll need for your collections of either shoes or purses. Racks can fit great in a reach in closet or entryway closet. Get creative and paint a wooden rack with your very own personal style! Pop up and foldable closet storage organizers are available that attach to your closet rods. These organizers are perfect for reach-in closets by adding additional compartments not offered by a standard closet. 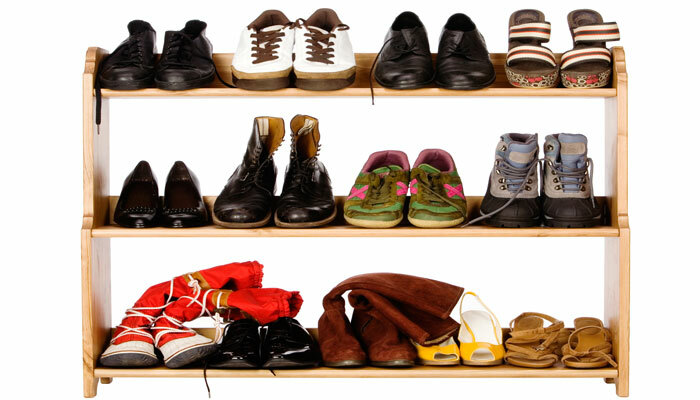 Boxes and bins are a simple way to keep shoes together if you don't have such a large collection. 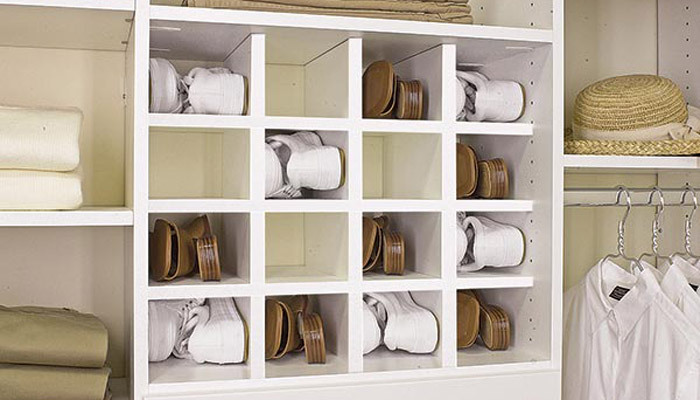 Storage boxes made specifically for shoes can fit nicely on your shelves and come in many different styles. 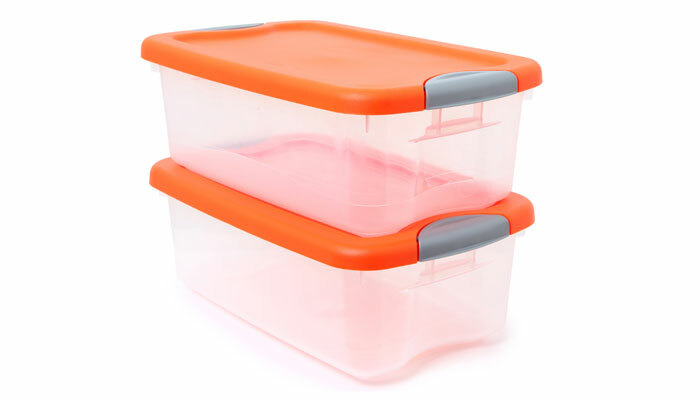 Plastic bins are a very inexpensive and temporary solution for organizing individual pairs. 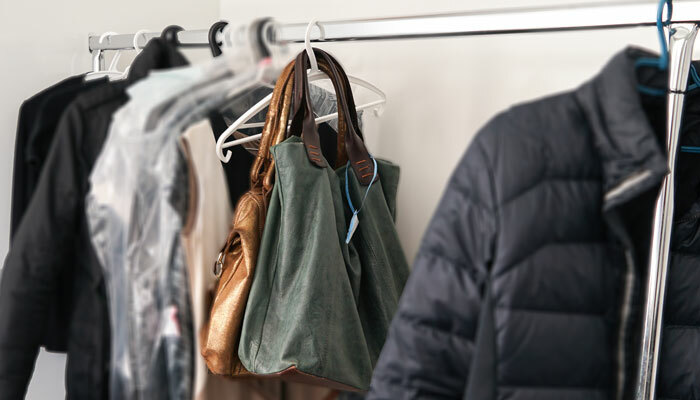 Hanging purses on hangers is a quick and easy fix. Use sturdier hangers and make sure purses are empty so the hangers don't break. Removable hooks are an option if you don't want to do any damage to your walls. Place removable hooks on the back of your door or on the side of your closet wall for extra storage. Removable hooks have weight limits, so be careful of how many purses you hang from each hook. Your closet can be transformed into a spectacle with some revamping and fine-tuning. 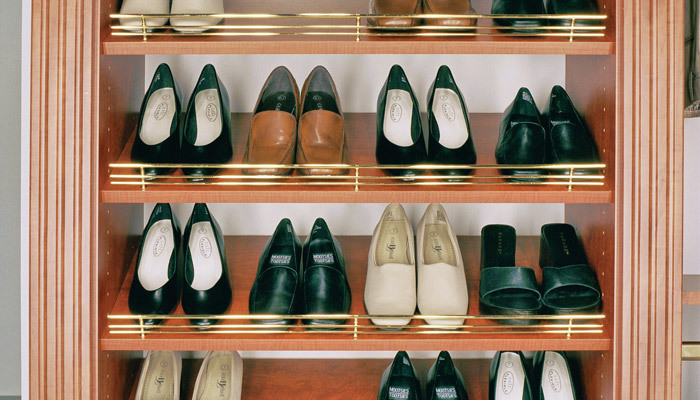 Here are some closet options to really put on a show while organizing your shoes and purses. Closet lighting can instantly transform and elevate the mood of your closet. 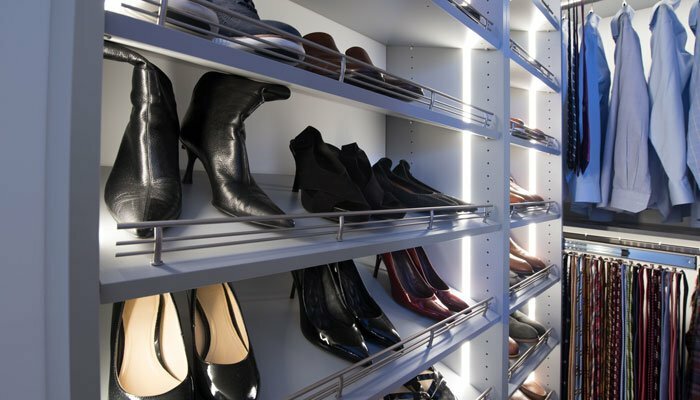 Closet Works offers several uplifting closet lighting options to showcase your shoes and bags. Glass cabinets can truly turn your closet into a sanctuary. The opulent effect of your belongings behind glass cabinets make them look remarkably special. Glass shelves are a delicate option that turn your shoes and bags into works of art. For those looking to revolutionize their shoe and purse storage, the 360 Organizer® by Lazy Lee® is worth considering. The 360 Organizer® comes in four different models: "The Double Hang", "The Shoe Spinner", "The Valet", and "The Pantry." Depending on size and style of your shoes, the Shoe Spinner model can hold up to 200 pairs of shoes. 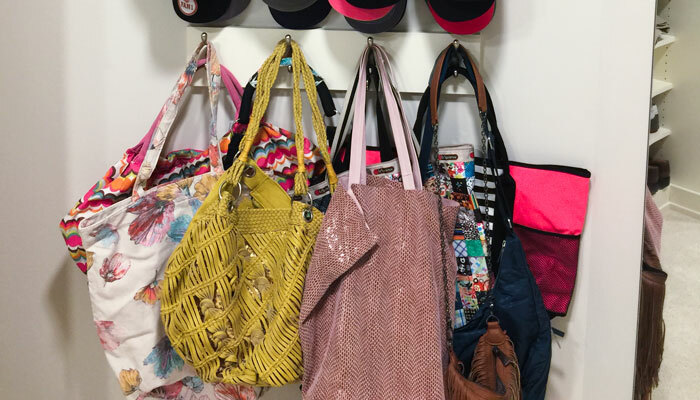 A 360 Organizer® can be customized to your liking with innovative features focused on your storage needs including hooks and adjustable shelves for clutches and handbags. Hopefully these tips inspired ideas for you to organize your shoes and purses! There are thousands of ways to organize a closet, your closet should be as unique as you. The above list of considerations is just the first step in designing your perfect closet. Let one of the talented closet designers at Closet Works help you achieve that perfect closet design.